The Leadership Council held its annual student club awards luncheon and officer transition ceremony on April 26. 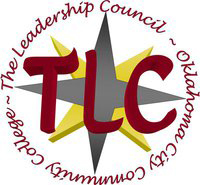 TLC is an organization made up of representatives from each student organization, plus a number of at-large members. Its mission is to unite other groups to achieve and excel at their goals at OCCC, said Angela Gutierrez, president of The Young Democrats. The annual club awards luncheon is designed to honor those individuals and organizations that have made an impact on both the community and the college in an outstanding way. During the luncheon, the torch of leadership was passed to Gutierrez. Next year she will serve as president of TLC. “The Young Democrats and TLC are a great way not only to help the community but also to gain a different college experience,” Gutierrez said. “I am gaining a higher level of understanding by getting involved with my organizations.” Phi Beta Kappa representative and political science major Mary Newcome-Hatch was sworn in as the TLC director of communications and public relations. Acting Student Life Director Erin Logan presented the award for sponsor of the year to Shelly Tevis, sponsor for the Student EMS Association. Tevis is the clinical affiliation compliance administrator in the division of Health Professions. The member-of-the-year award is given to a non-office-holding member who has helped his organization achieve its goals. It was awarded to Akash Patel of the Multi-Cultural Student Business Club. Michael Southerland of Kappa Beta Delta took home the officer-of-the-year award for showing outstanding leadership within his organization. In honor of their work with the Life Saver 5K and 1 Mile Fun Run, the Nursing Student Association and the Student PTA Organization were awarded the Community Builder Award. The Student EMS Association won the club-of-the-year award that honors the organization that met and exceeded its goals and held a substantial community and campus presence. During the awards ceremony the members of TLC recognized Erin Logan, director of Student Life, for her outstanding efforts and service throughout the semester. Logan honored all of the officers who will be graduating in May and those sponsors for the organizations who use personal time to assist with the student clubs. Among those represented at the luncheon were the Multi-Cultural Student Business Club, Kappa Beta Delta, the College Democrats, the College Republicans, the Nursing Student Association, the Black Students Association, the Student PTA Organization, and the Student EMS Association. Visit http://occc.campusgroups.com/tlc to learn more about TLC. To contact Laurence Greene, email onlineeditor@occc.edu.